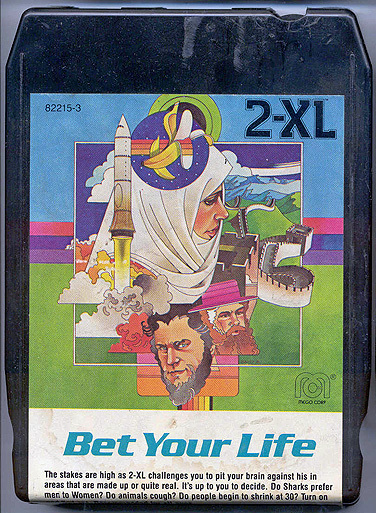 World of 2-XL: Mego 2-XL Program "Bet Your Life"
Other Comments: Rather than start calling the programs General Information IV, V, etc., Dr. Freeman started using slightly more creative concepts to tie general information programs together. One of them was making the programs into "games," where 2-XL assigns points depending on how well you answer, and then evaluates your score. This program does four such games, with Game 1 & Game 2 on the first program, and Game 3 & Game 4 on program 2. 2-XL also occasionally gives you choice of difficulty level, with more difficult questions being worth more points. Of course, being a two-program tape, it's not threaded like the Tiger tapes are, so once you answer he can only tell if you're right or wrong and can't actually remember what difficulty level you picked, so you have to rely on the honor system in those cases.